Thank you to Rosy for sending this card from Andorra. 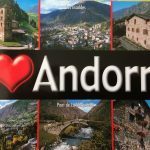 Andorra is a tiny (468km²) landlocked conutry in the eastern Pyrenees between France to the north and Spain to the south. The population is just over 77 000, but the nation plays host to over 10 million tourists per year, almost all of whom visit for the skiing and Andorra’s duty-free status. In geography lessons you may learn that landlocked mountainous nations are more likley to have a lower economic development; this is not true of Andorra which has an HDI of 0.858, comparable with its neighbours France 0.897, and Spain 0.884. You can read more about HDI (human development index) on Geography Cat’s Learning Blog.